This is Room 25A. 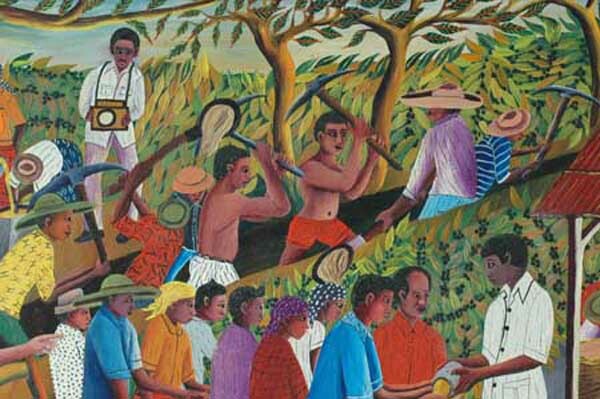 A Haitian Painting by Wilmino Domond. 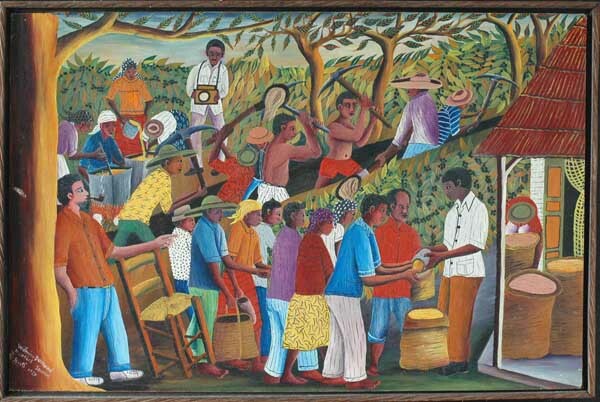 Wilmino Domond was born in 1925 in Jacmel. He has always lived and worked on his remote coffee farm, accessible only by horseback, in the mountains outside of Jacmel. he lives there today, but is no longer paitning. He was inspired to paint by his cousin, Castera Bazile, and has himself influenced several of his younger cousins, including Celestin Faustin, Ezene, Parizot, Ury and Hughes Domond. Selden Rodman referred to him, Gerard Valcin and Andre Pierre as "the dominant figures of the second generation." 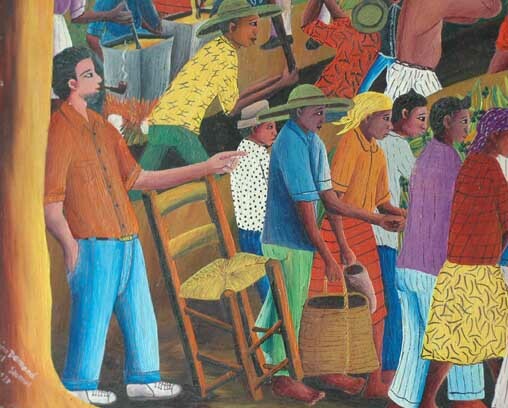 A painting of his was on the cover of the paperback edition of Selden's guidebook, "Haiti, The Black Republic." The same painting was featured in the landmark exhibit, " Haitian Art" curated by Ute Stebich for the Brooklyn Museum in 1978. Ute says of his work, " Brightness of color, with a preference for reds and oranges, and a love of pattern and design characterize Domond's work. The movements are stylized and distorted whenever he depicts motion. The artist uses every opportunity to turn form into pattern, with little elaboration of space. Although they are basically flat, his paintings nevertheless transmit a rhythm and vibrancy expressing this artist's joy of life. " His work is included in most important museum collections. His paintings are scarce. 1973 $6000 framed in a simple Haitian frame. The signature reads " WilminoDomond, Marbial, Jacmel, Haiti 1973.